When an object moves to and fro or back and forth along the same line, it is called simple harmonic motion (SHM). Have you seen the pendulum swinging to and fro along the same pathway, these similar back and forth movements are called oscillations. It is used to model many real-life situations in our daily life. Let’s understand some of them. You all must have seen the pendulum in the clocks moving to and fro regularly. When we pull a simple pendulum from its equilibrium position and then release it, it swings in a vertical plane under the influence of gravity. It begins to oscillate about its mean position. 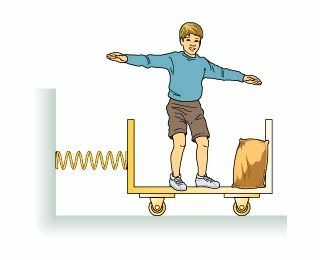 Therefore, the motion is oscillatory and is simple harmonic motion. Swings in the parks are also the example of simple harmonic motion. The back and forth, repetitive movements of the swing against the restoring force is the simple harmonic motion. Springs/Shockers are attached to the wheel of the cars to ensure a safe ride to the passengers. Every time the car hits a bumpy road, these springs/shockers act as shock absorbers; leading to a smooth ride. The restoring force on the spring will push the car wheel back into place. When a musician strums the guitar, the vibration of the strings produce sounds that the human ear hears as music. When a guitar string is plucked, it moves a certain distance, depending on how hard the guitar player strums. The string returns to its starting point and travels nearly the same distance in the opposite direction. The vibrational energy of the string is dissipated in the form of sound. The amplitude of the vibrations decreases gradually. The volume of the sound fades until the string eventually falls silent. The bungee jumping is also an example of simple harmonic motion. The long elastic rubber is tied to the ankle of the person who then jumps off from the bridge or certain height. The jumper is oscillating down and up and undergoing SHM due to the elasticity of the bungee cord, albeit to decreasing altitude. The process of hearing is not possible without simple harmonic motion. The soundwaves which enter our ears, strike the eardrum; causing it to vibrate and then this information caused by vibration is passed to the brain, which translates the signals into complex sounds that we can understand clearly. The back and forth movement of the cradle is caused by a single push to it and is maintained by the principle of SHM, and hence, causing the baby to sleep.